When your flight is delayed three hours, you have some time to observe your fellow travelers. So I walked around the lounges at Gates E5 and E6 at the Dallas-Fort Worth Airport, observing what people appeared to be doing and using. Three pairs of people were conversing with each other. One appeared to be working on some papers from his briefcase. I counted the woman pictured above as a laptop and a phone because, well, look. I just counted the people I saw in a brief walk around the waiting lounge, trying to catch just the people in a particular area as I walked by, rather that counting people as they came and went. So the woman who just sat down across from me with a smartphone isn’t included. I did not count myself (keeping tabs on my iPhone, then blogging on my laptop) and I did not count Mimi (iPhone in hand, iPad on lap). This is a small sample and just a snapshot. I don’t think any deep analysis here is merited, so I won’t attempt any. But I’m pleased that my company is pursuing a Digital First course. So, I now have 6 emails from United and flight is delayed over 3 hours. @stevebuttry and I having beers to celebrate. Except for the dress/skirt part, I would completely be that woman. Except with earbuds in too, and everything would be Apple. Must have everything at the same time or what’s the point? 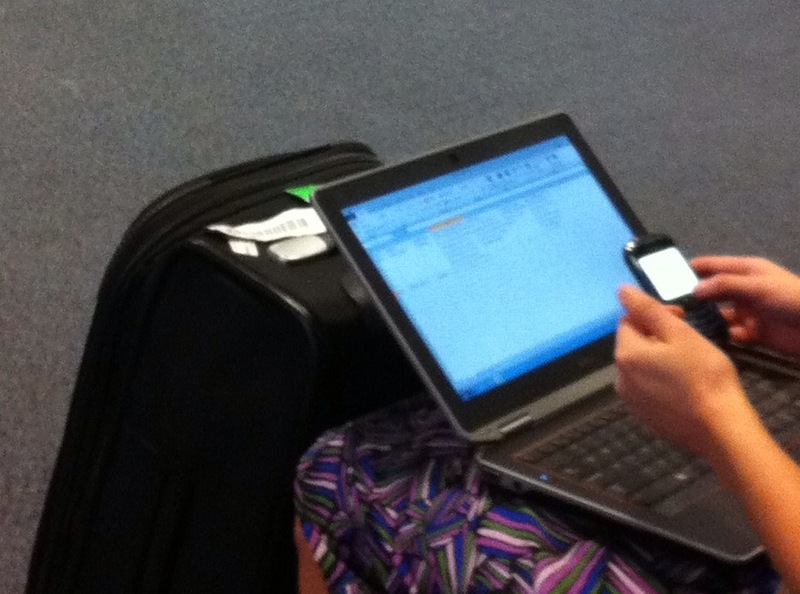 Just my 2 cents: while waiting for my flight at Austin Bergstrom, and just on 2 rows of seats: 10 macbooks, and 2 tablets. Didnt try to figure out smartphones number, tho.